hile for years the quality of Spanish wine in the more established regions and DOs had been acceptable it could also have fairly been said that the real potential in the country remained untapped. However, the past half decade or so has seen dramatic change both in fine-wine production and in lesser regions. 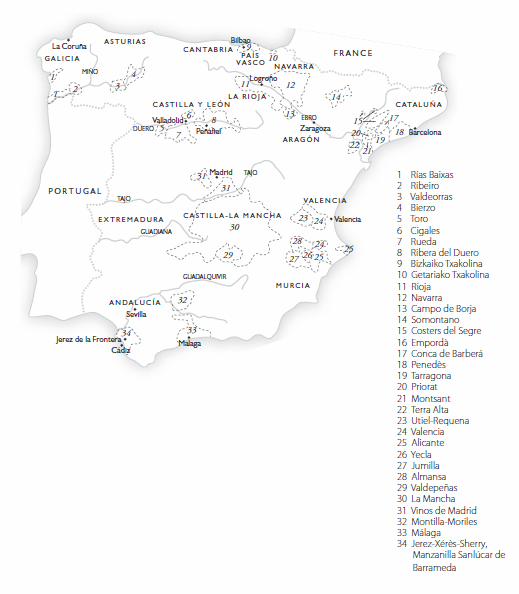 There are new-wave Riojas and an abundance of great reds from Castilla y León, but other, smaller regions like Priorat have also been providing some remarkable nd striking wines in recent years. Further south, in the great centre of the country, relaxation of the regulations governing irrigation and a desire to harness the potential of the best hillside sites as well as some fine, old bush-vine plantings of regional varieties has brought increasing change. It remains depressing, however that despite all this there is still a sizeable amount of sometimes very mediocre wine being produced in almost all the established regions.